Bhopal, May 14 (IANS) Prime Minister Narendra Modi will pay a one-day visit to Madhya Pradesh on Monday to participate in the concluding ceremony of the ‘Namami Devi Narmada Sewa Yatra’ in Anuppur district. Official sources said Modi will fly to Dumna airport in Jabalpur from Delhi in the morning. Chief Minister Shivraj Singh Chouhan will receive him at the airport. Modi will take a chopper ride from Jabalpur in the afternoon to reach Amarkantak to participate in the event, which will mark the end of the Madhya Pradesh government’s pet project. 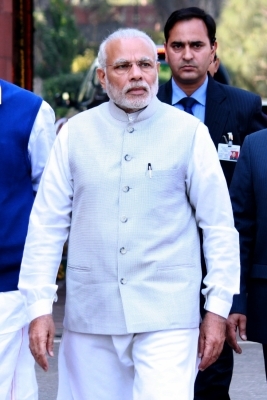 The Prime Minister will return to Delhi from Jabalpur around 5 p.m. The Narmada river originates at Amarkantak. The Yatra had started from Amarkantak on December 11, 2016, and is concluding there after covering a distance of nearly 3,500 km.